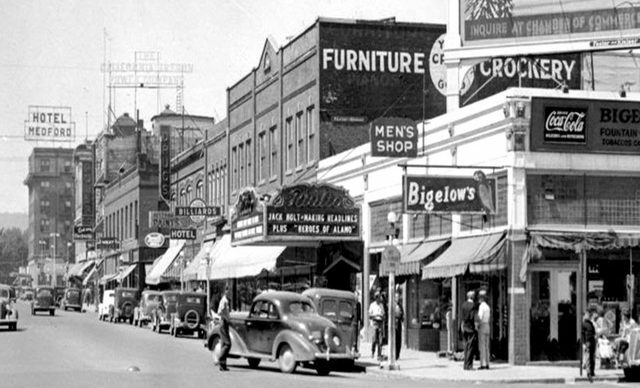 112 W. Main Street, 1927. 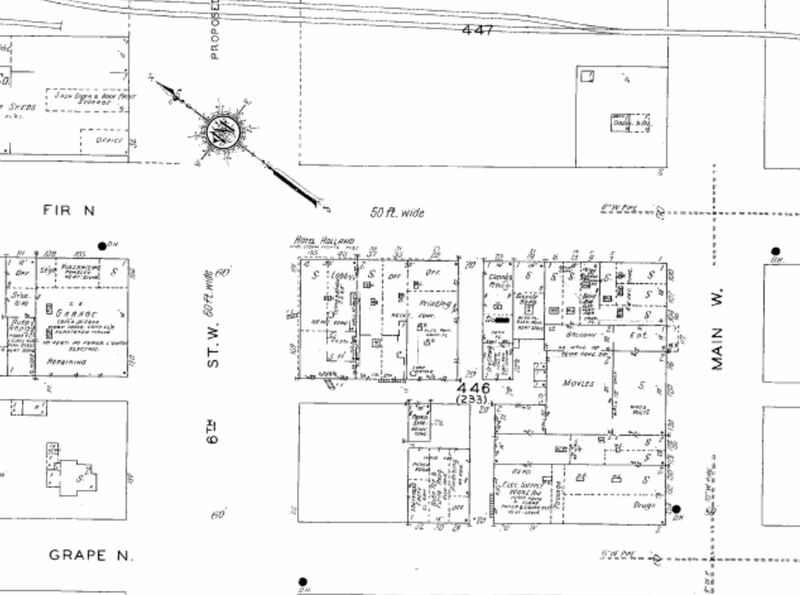 Digital Sanborn Maps. 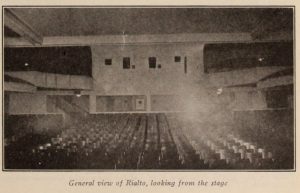 Number of seats: 700 – 1,000 (total), 850 auditorium, 150 wicker lodges. 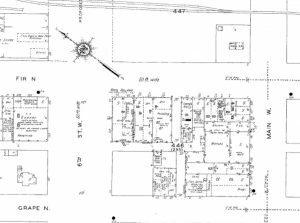 According to the local newspaper, Medford Mail Tribune, “The auditorium will seat 850, and the wicker lodges will seat 150. The auditorium seats will be leather upholstered, individual unit chairs, each chair to be provided with an air cushion and to carry the firm monogram M.&P. 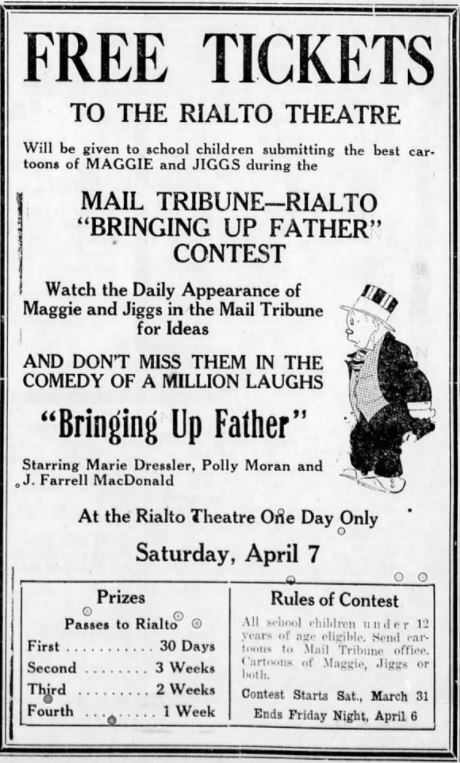 Co” (Medford Mail Tribune, May 14, 1917, p. 4). It is important to note, however, that according to Motion Picture News, in their full page feature on the Rialto Theatre, that “The Rialto seats 700 people” (Motion Picture News, Dec. 7, 1918, p. 3369). Owners/Managers: A. J. Moran and H. L. Percy, Mr. & Mrs. George A. Hunt, S. G. Mendenhall manager and publicity director (Medford Mail Tribune Sept. 30, 1928, p.3), C. F. Hill (Motion Picture News, Mar. 29, 1919, p. 7). Motion Picture News. 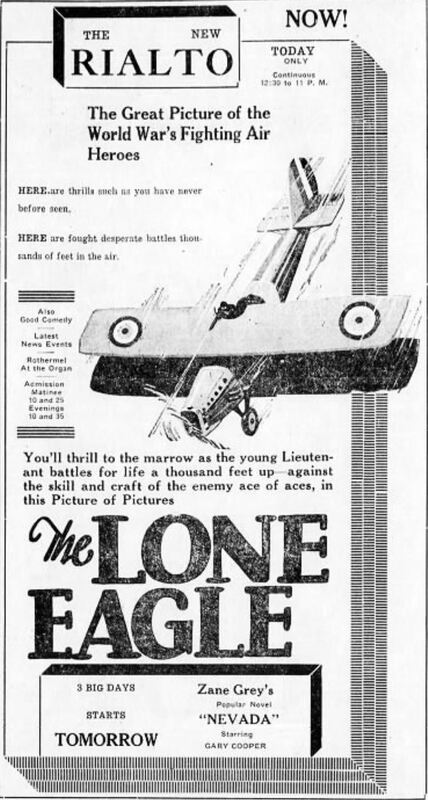 Dec. 7, 1918, p. 3369. 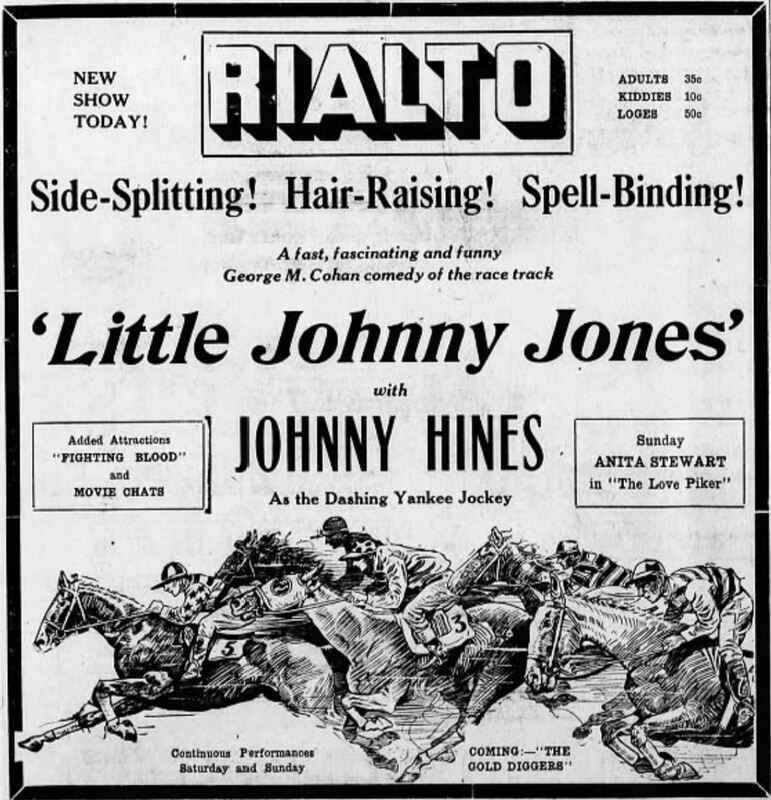 In a full page spread feature of the Rialto Theatre in Motion Picture News, one of the theaters owners, A.J. Moran, stated that “There is a novel plan used with the changes in program, of which there are four a week. 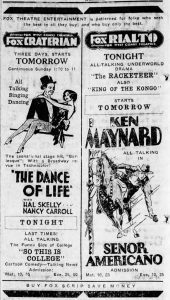 The special emphasis is put on the attraction that is run for three days, Saturday, Sunday and Monday, and generally there is a special lobby display” (Motion Picture News, Dec. 7, 1918, p. 3369). 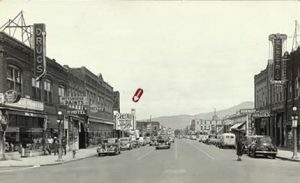 During the month of October, the George Hunt Theaters Co. celebrated the anniversary of the company’s incorporation with specialized anniversary programs’. These programs included special events such as the ones advertised for the company’s 9th anniversary: “Good Pictures, Vaudeville and Revues Will Be Offered on Anniversary Month Theater Programs” (Medford Mail Tribune, Sept. 30, 1928 p. 6). 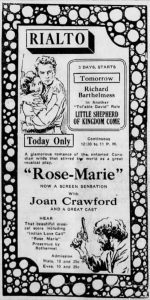 The company took out a full page spread in the Medford Mail Tribune in order to advertise the specialized anniversary programs that the Rialto and Craterian Theaters would be presenting throughout the month of October. In the Motion Picture News feature, owner A.J. 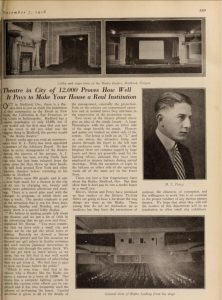 Moran said “‘We believe in making people talk about our theatre, and we put a lot of faith in the advertising that we get now and then'” (Motion Picture News, Dec. 7, 1918, p. 3369). 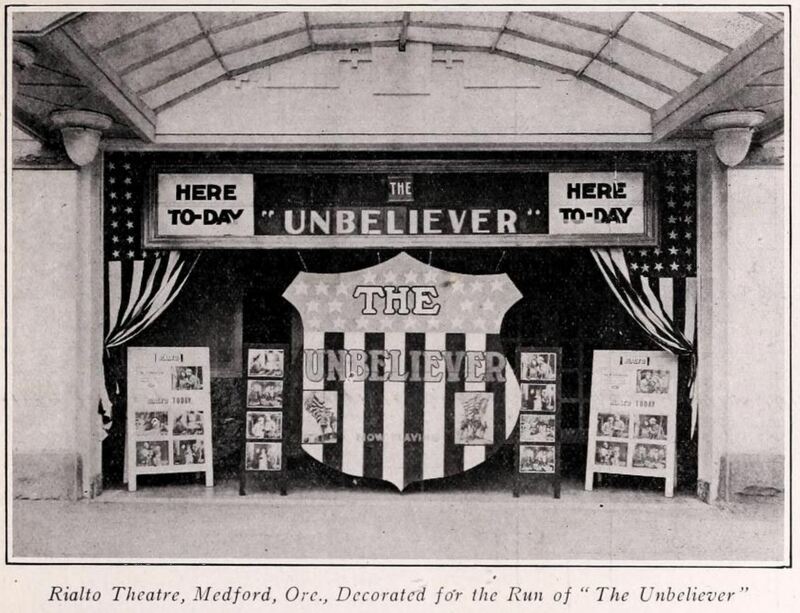 The theater utilized advertisements in the local paper, Medford Mail Tribune, while also holding special events and promotional stunts in order to get patrons in the door. For example, owner A.J. 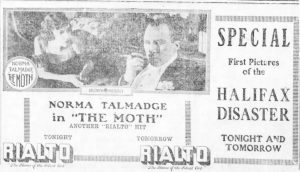 Moran mentioned in the Motion Picture News feature that “‘Recently we [the Rialto Theatre] showed a Sessue Hayakawa picture and for this occasion we dressed our girl ushers in Geisha costumes and used various Japanese decorations in the lobby and through the entire block. 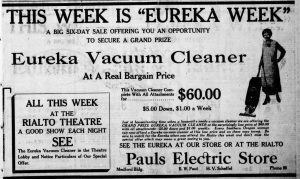 We did not get back as much money as we spent, but we felt that it was well worth while because of the amount of advertising that we got from it” (Motion Picture News, Dec. 7, 1918, p. 3369). By putting on these events, the theater was ensuring that citizens knew the theater and, as Mr. Moran stated, “‘We find that it pays to keep our house before the public'” (Motion Picture News, Dec. 7, 1918, p. 3369). 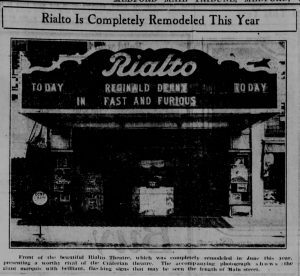 The Rialto Theatre’s advertisements were big and flashy from the very beginning of the theater’s opening. 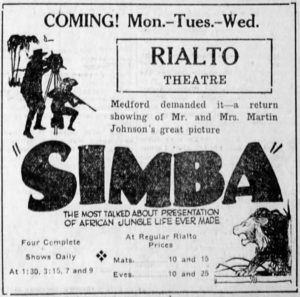 Not only did they include photographs or illustrations from the films featured that week, but they often times were quite large on the second page of the Medford Mail Tribune, the local newspaper. The theatre’s logo changed and evolved throughout the growth and development of the theatre. In the beginning, the theater used capitalized block letters for its logo and utilized the style on and off from 1917 to 1924. 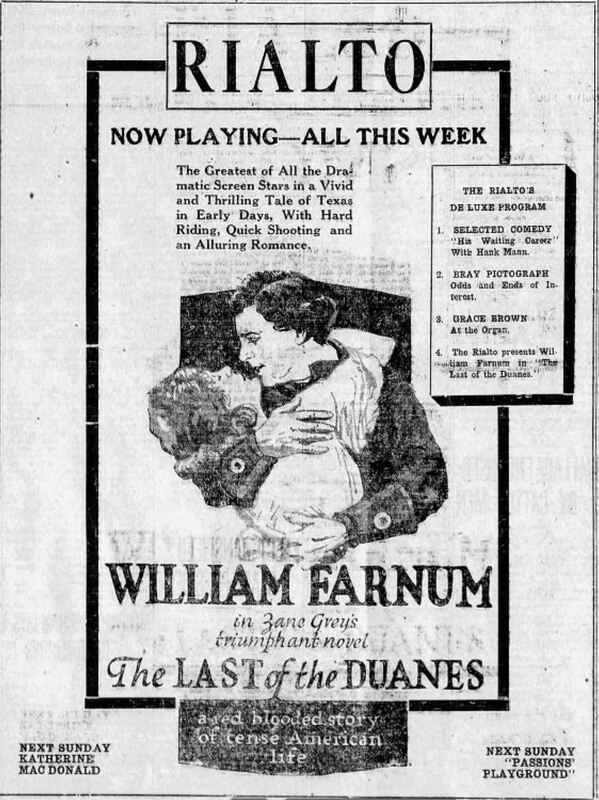 In an early rendition of the theater’s logo, the words “The Home of the Silent Art” were printed underneath the logo, indicating that this movie palace was the place to go for high quality entertainment. In another iteration of the theater’s logo, an arrow was included across the theater’s name that encapsulated the words “Where Everybody Goes”, therefore showing the prestige and popularity of the theater within Medford. 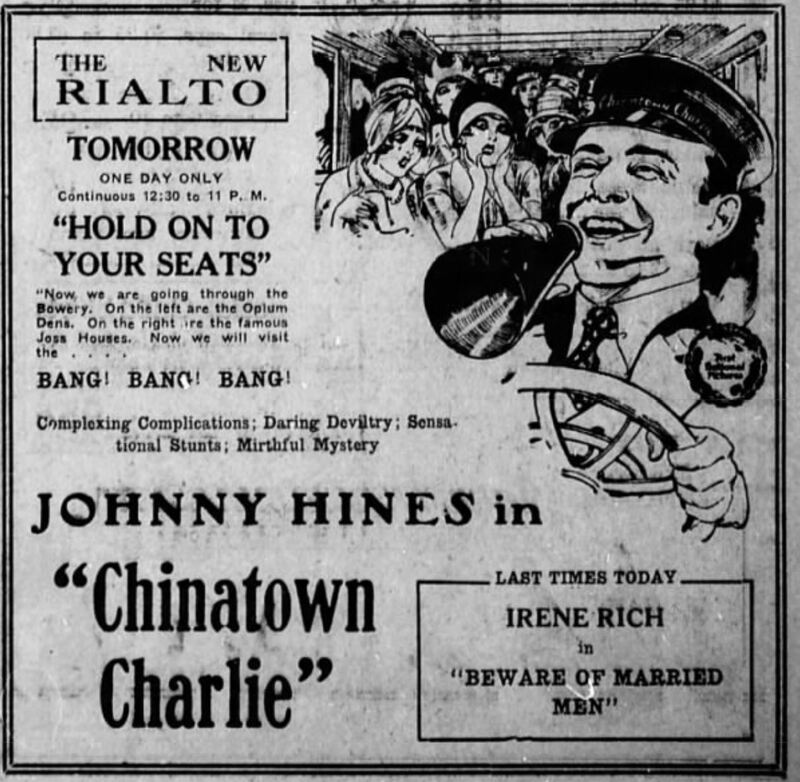 Throughout the theater’s run, it utilized different stylistic embellishments for its advertisements in order for them to really jump off the page. 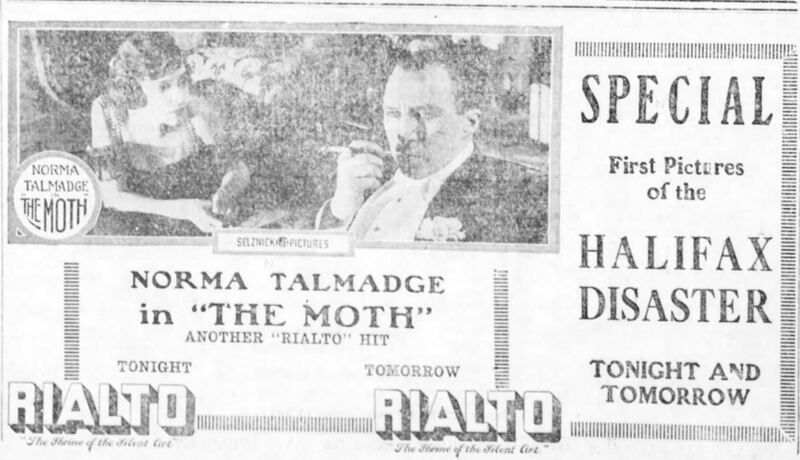 The theater often ran multiple advertisements in the daily paper, several times a week in order to advertise the films currently playing and ‘coming soon’ to the theater in order to tease patrons about what’s coming next to the Rialto. 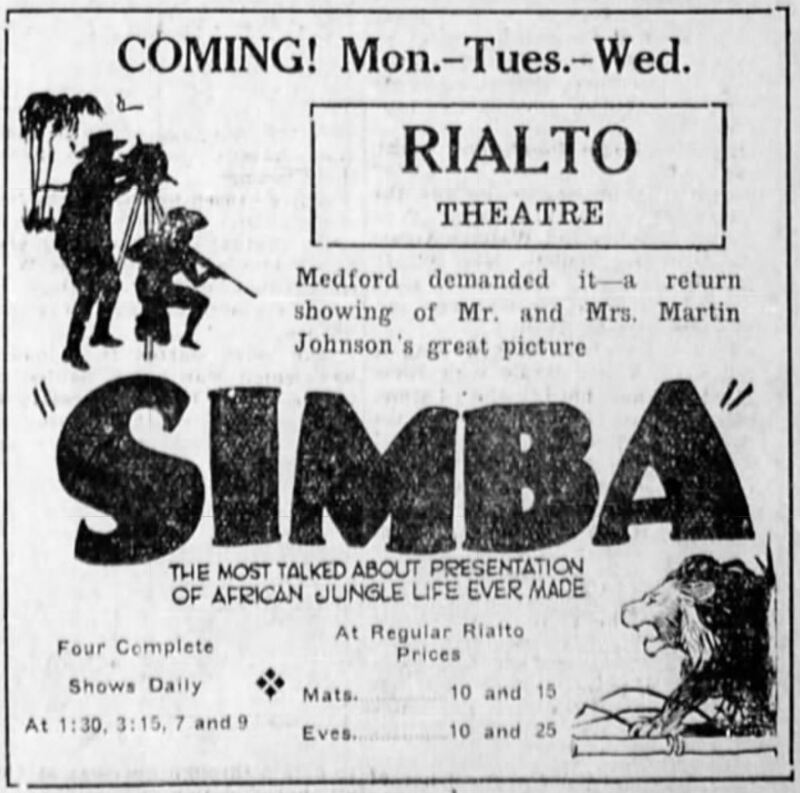 Provided below are examples of the advertisements and articles that ran in the local Medford Mail Tribune for the Rialto and exemplify how the theater evolved and grew throughout its first few decades of operation. Medford Mail Tribune. Apr. 1, 1928, p. 6. Medford Mail Tribune. 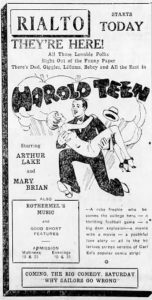 Sept. 9, 1928, p. 6. Medford Mail Tribune. May 17, 1928, p. 3. Medford Mail Tribune. 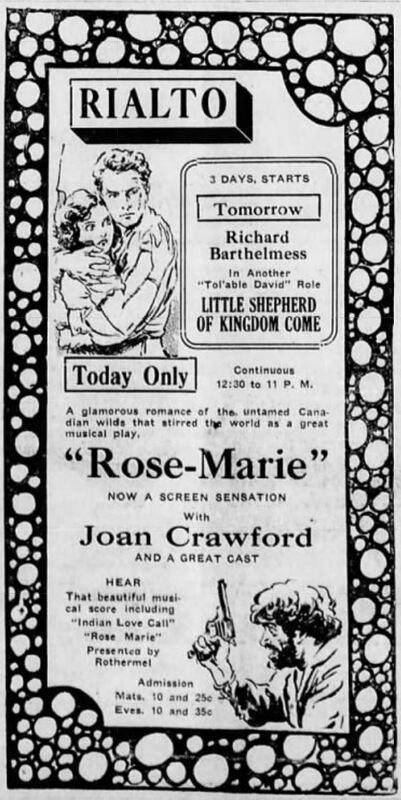 Jan. 11, 1930, p. 2. Medford Mail Tribune. May 17, 1930, p. 3. Medford Mail Tribune. Feb. 15, 1924, p. 3. Medford Mail Tribune. 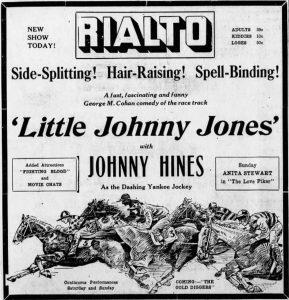 Sept. 5, 1930, p. 2. Medford Mail Tribune. 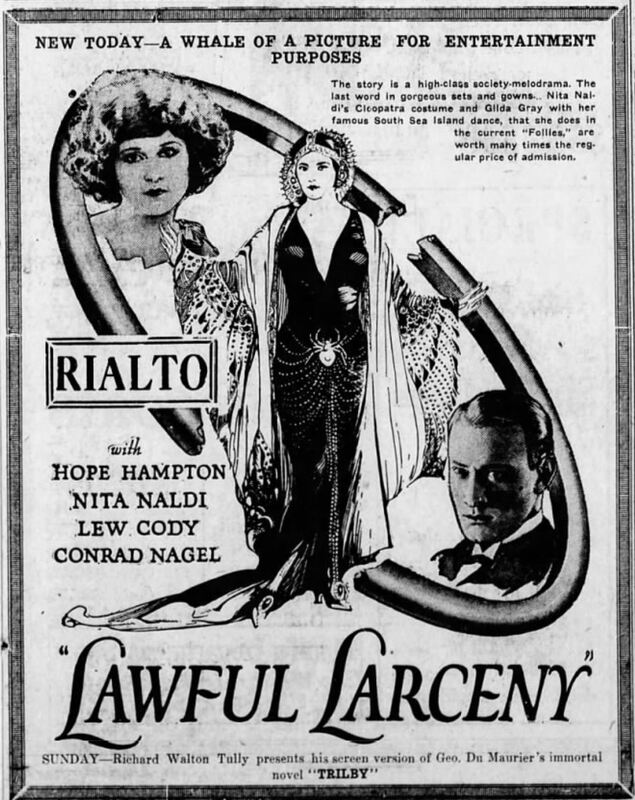 Aug. 13, 1919, p. 8. Medford Mail Tribune. 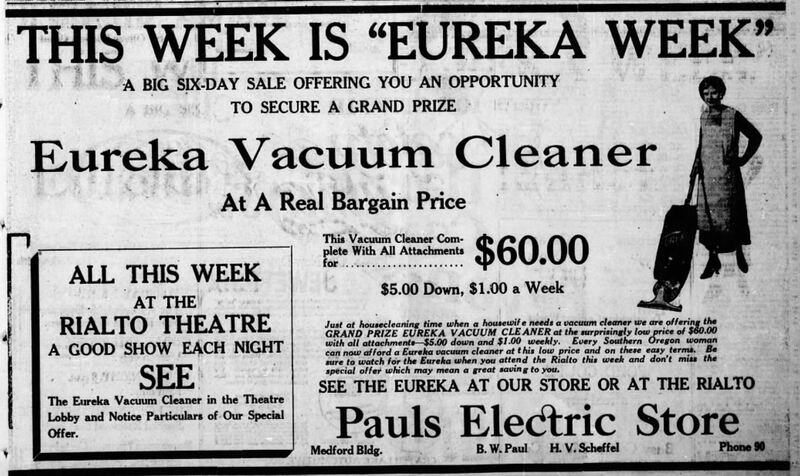 Sept. 25, 1927, p. 6. Medford Mail Tribune. 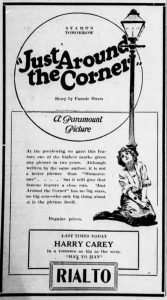 Jan. 12, 1921, p. 2. Medford Mail Tribune. 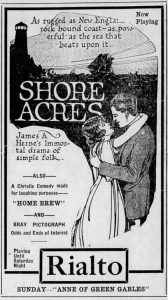 Jan. 2, 1918, p. 6. 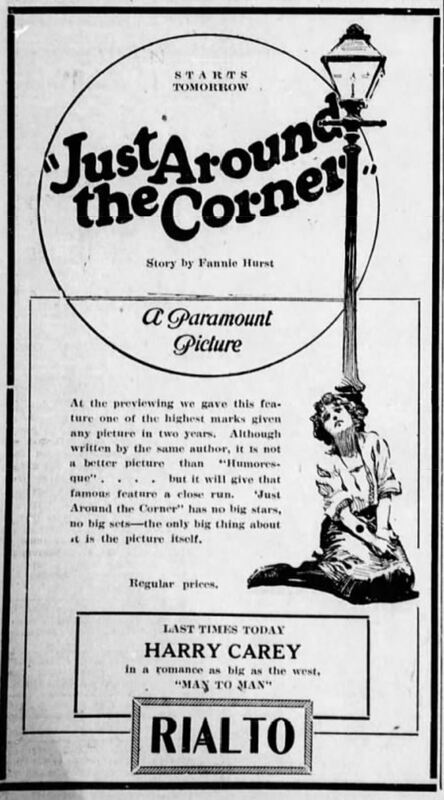 Motion Picture News, Dec. 7, 1918, p. 3369. Motion Picture News. 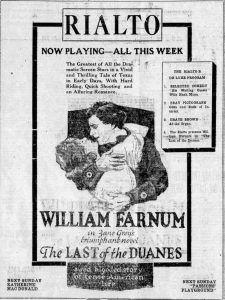 Oct. 12, 1918, p. 2359. Medford Mail Tribune. Feb. 1, 1924, p. 3. Medford Mail Tribune. May. 25, 1928, p. 3. Medford Mail Tribune. 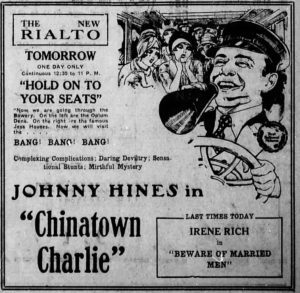 Jan. 30, 1924, p. 2. 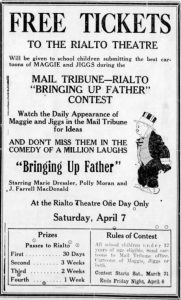 Medford Mail Tribune, Apr. 29, 1920, p. 6. 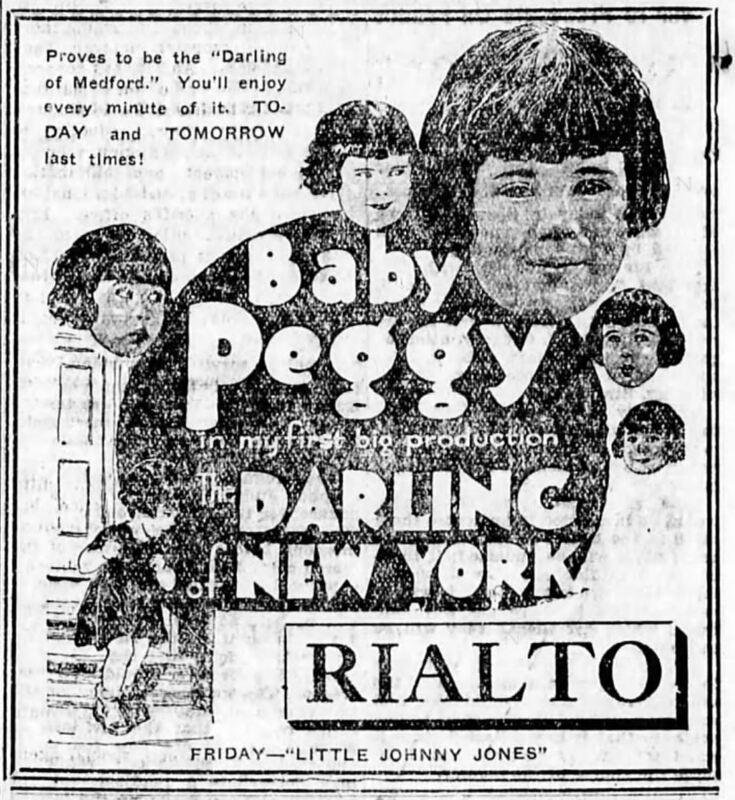 Medford Mail Tribune, Aug. 8, 1922, p. 6. Medford Mail Tribune, Jun. 22, 1923, p. 8. 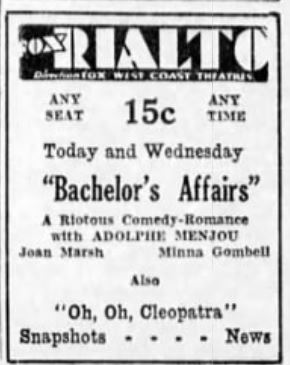 Medford Mail Tribune, May 16, 1925, p. 6. Medford Mail Tribune, Apr. 18, 1926, p. 3. 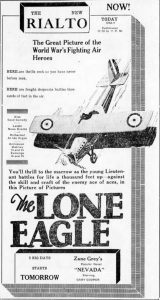 Medford Mail Tribune, Aug. 17, 1929, p. 3. Medford Mail Tribune, Jul. 19, 1931, p. 2. Medford Mail Tribune, Nov. 22, 1932, p. 7. 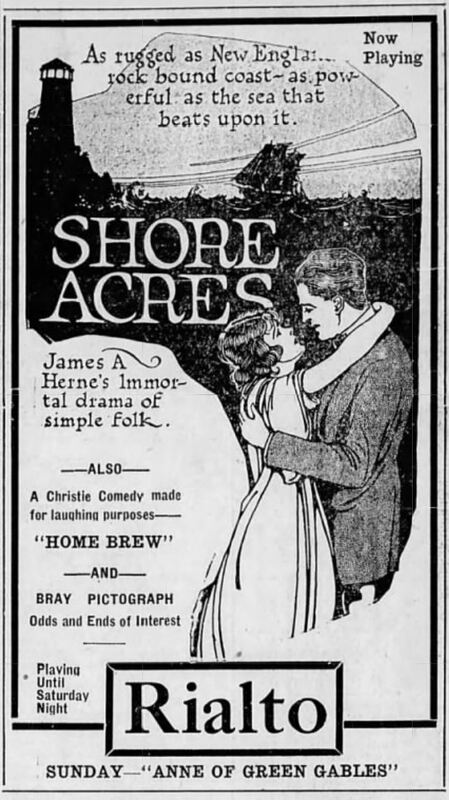 Medford Mail Tribune, Aug. 30, 1918, p. 6. 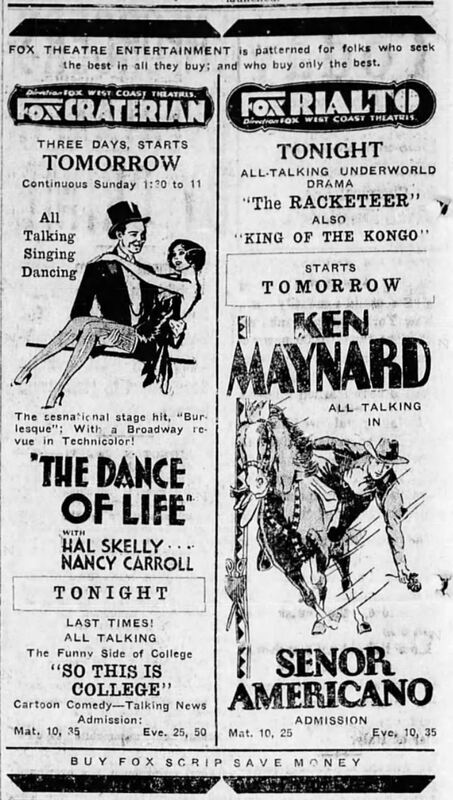 Advertisements courtesy of Medford Mail Tribune. 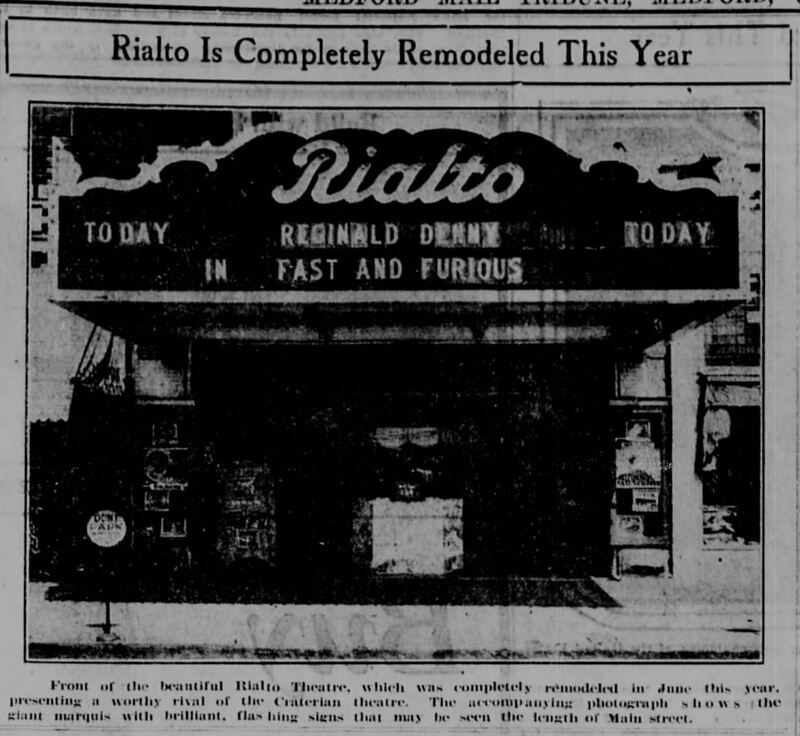 “Rialto Theater.” Cinema Treasures, Cinema Treasures, cinematreasures.org/theaters/36552. Truwe, Ben. “The Rialto Theater.” Southern Oregon History, Revised, Talky Tina Press, 5 Mar. 2017, truwe.sohs.org/files/rialto.html.